• Food Storage: Bought more rice and added another bag of wheat to up my storage a bit - I hear prices are going up on that kind of thing. Wish I had room for even more! • Sustainable Living: Learned a lot from Joel Salatin this month... does that count? I also acquired two more basil plants, four more lavender plants, attended a meeting with a Range Management Consultant and had plant samples from my acreage identified. Now I know some of the edible (and toxic) weeds and brush for my goats to browse on. I also acquired a DVD on Polyface Farm... I'm really jazzed about learning a few things to make my homestead more sustainable. Today's Give-Away & Last Month's Winner! Laura of Laura Williams' Musings! This month our give-away item will be arriving at someone's home, just in time for the apple harvest! 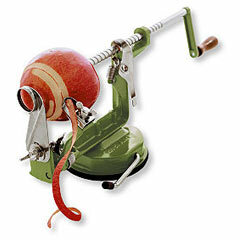 The Back to Basics Apple Peeler allows you to peel, core, and slice an apple in about one minute. I love how it makes my apple pies look so much prettier, but really, all those uniform slices actually help the pie to cook more evenly (at least it seems that way to me). And it definitely makes dehydrating apples better. Anytime your slices are all the same size, you're going to have a better success rate over all. Thicker slices take longer to dehydrate than thinner ones and then you have to take a lot more time to assess every single slice. When their the same size, you only need to examine a few really well and if you see consistency, you can assume you have it throughout. And it can be used for more... click here to read all about it. Also, if you'd like to know more about dehydrating apples or making your own applesauce, USA Emergency Supply has a page dedicated to the topic of Dehydrating Fruit. The winner will be able to select between the suction base and the clamp mount. NOTE: This challenge and give-away ends Friday, August 3rd at 11:59 p.m. PST.